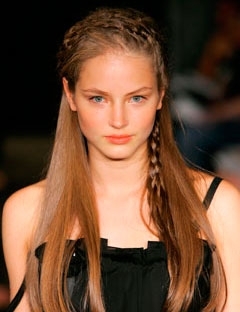 Braids are an easy way to add a touch of sophistication to an otherwise plain hairstyle. With a little creativity and by putting your skills to work you can instantly create a more eye catching style in a matter of minutes. Discover how you can perk up your style with partially braided hairstyles that will totally change your look. Partially braided hairstyles are an excellent choice whenever you feel that your current hairstyle is not satisfying enough for you but still don' t have enough time to try a more complex hairstyle that would emphasize your natural beauty a little better. Braids can give you the perfect equilibrium between a casual, romantic yet surprisingly modern hairstyle at the same time. What's more , braided hairstyles are an excellent choice during summer when looking stylish without much effort becomes essential. With a few strategical waves, creating a wonderful and unique hairstyle becomes easier than ever before. When it comes to braiding, you can choose from a variety of braids depending on your personal preferences and on your skills. It seems that the most popular choice is the French braid. The French braid can be done extremely quickly and easily, being a perfect choice for beginners as well as for those who don't want to waste their much precious time styling the hair but still want to look fabulous. Loose hairstyles are perhaps one of the best examples when it comes to a quick and simple style that can look impressive with little effort. A simple side braid is enough when you want to completely transform a style. If you whish to get a Greek goddess hairstyle in a matter of minutes, you can easily accomplish this desire by opting for a double braid joined in the back. The thickness of the braid is entirely up to you but most women prefer to create two medium braids to get this look. Women with long hair also have the option of placing multiple thin braids across the crown area of the head which will allow them to create an edgy hairstyle that might be unusual but that can be extremely flattering for those who don't like to conform to the classic rules that have contributed to the creation of more popular hair styles. A similar principle can be applied to ponytail hairstyles as well. Those who have naturally wavy hair will surely benefit from adding a braid for a seductive bohemian look that will surely enchant everyone. With minimal styling, a ponytail can become a surprisingly elegant and sophisticated style that will be suitable for a variety of occasions. The following styles are a great illustration of how a little creativity can have a spectacular effect. If a messy bun seems a little simplistic for you, then an impressive braid might be just what you need to save the day. The braid can become the first or second focal point of this hairstyle depending on where you choose to place it. A low braid might be a second point of interest being used to emphasize the bun while a more centrally placed braid will become the main point of attraction for your hairstyle. Half up/down hairstyles as well as updos can be well emphasized with the help of a few simple braids as well. Celebrities often managed to enchant millions of viewers by choosing to wear updos combined with delicate braids creating the ultimate image of femininity, grace, style and elegance. Therefore, next time when you feel that your hairstyle has not reached its true potential try a few of the ideas presented in this article to add an instant modern touch to your hairstyle.